You are here: Home / Holiday / Halloween / Happy Halloween! Happy Halloween, Ghouls and Ghosts! Today was the day we were supposed to “paint” that pie pumpkin. As it happened, we didn’t paint it at all. 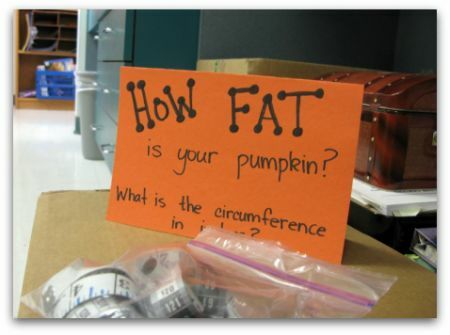 Instead, Fuzz’s class had to weigh and measure their pumpkins, then gut them and count all the seeds by ten. Sounds like party to me! See, our schools aren’t allowed to celebrate actual Halloween, so this event was called The Great Pumpkin Experience. It was fun, plus I got to meet the class Gecko. I’m not exactly sure when or what today’s cookie will be. Maybe I’ll make jelly donuts for all the trick-or-treaters. Happy Halloween to you and Fuzz! They’re not allowed to celebrate Halloween? Jeez, how holidays change. I’m old enough to remember getting apples with silver paper covered coins stuck in them, but young enough to be warned that any baked good give out by some unsuspecting old lady must have a razor blade in it. I bet all of the kids in your neighborhood are disappointed they aren’t getting homemade jelly doughnuts! I’m with Fuzz, I really can’t stand the gutting a pumpkin part of it. I don’t like the smell either, but I do love things made with pumpkin, just like it when all the work has been done for me. The pumpkin my 10 year old picked out was in the beginning stages of rotting, we carved them with some friends over, so each adult was assigned a kid to help. Heaven bless Tes, she helped Scott gut his very stinky pumpkin. I would have given up and was almost gagging from just being in the same room with them. Their pumpkin turned out cute though. I forgot to take pictures, and now all the pumpkins look like old men with no teeth. Haha that is a great face! Happy Halloween. 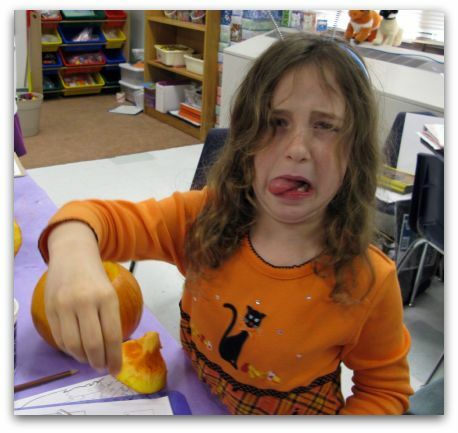 Yeah, but she didn’t like the pumpkin smell. It was kind of gross. Sounds like fun to me. Wasn’t Fuzz enjoying it?